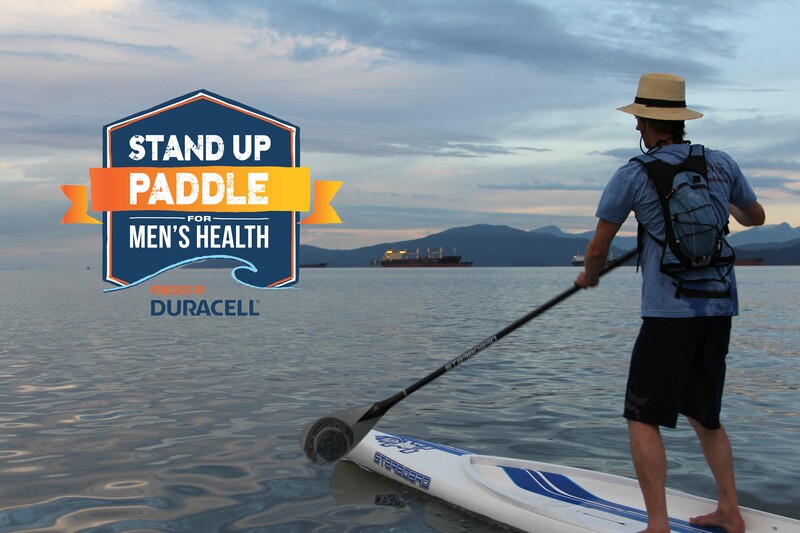 Two weeks ago, Simon Whitfield and 10 paddlers embarked on a 3 day paddle boarding journey across the Salish Sea, powered by Duracell, in order to raise awareness for the Canadian Men’s Health Foundation. Writer Adrien Sala joined them on the journey and lets us in on what it was like here. 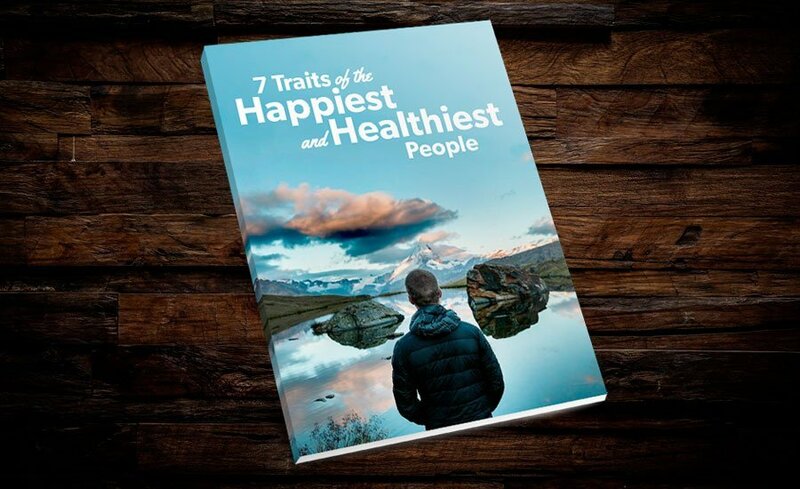 WHY IT MATTERS While most of us can’t relate to winning a gold medal, we all can understand having slumps in our activity – and hearing Simon’s story is a good reminder that people are people, no matter what level of success they’ve had or how fit they are. It also speaks to the connection between physical activity and mental wellbeing; when we aren’t active, we often feel the negative affects in our minds as much as our bodies. 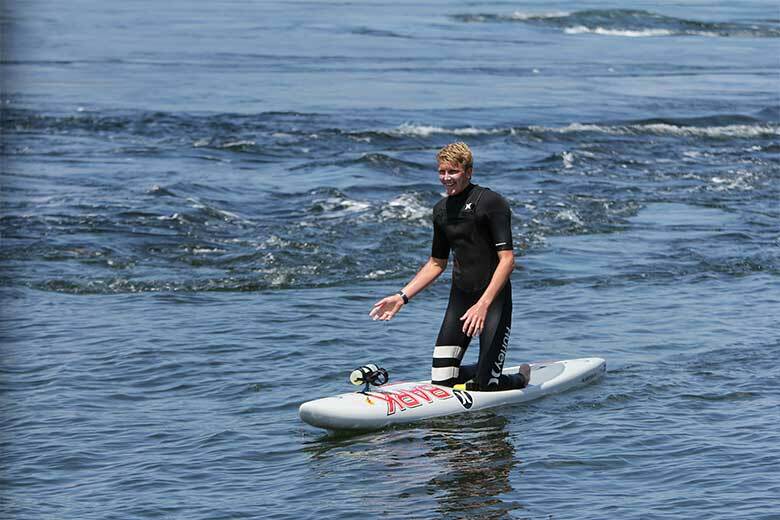 Just like Simon’s interest in paddling, which started with just one tentative try, changing your health doesn’t have to be an everything-at-once feat. Start by just making small changes, like having one less beer at the pub, that eventually led to significant ones. “It seems like telling men to just go out and get some exercise doesn’t really work,” says Wayne Hartrick, president of the CMHF. “Research has shown time and again that men pay attention to health messages from athletes. 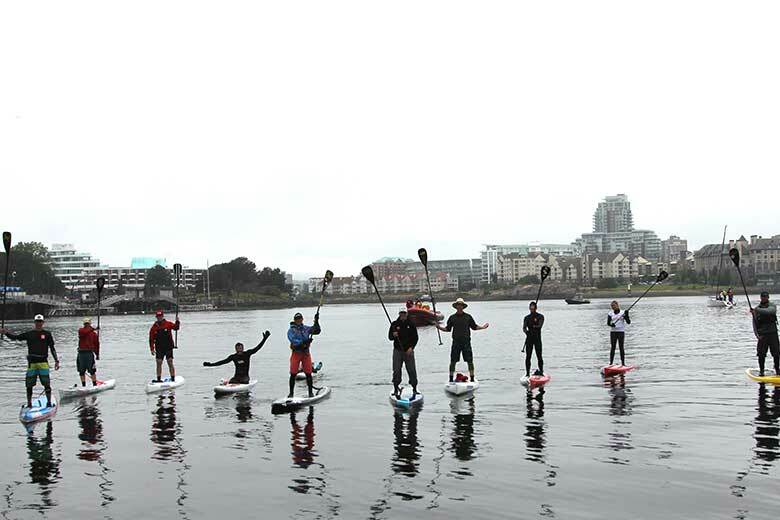 More so, than advice from their own doctors.” So in the spirit of bringing awareness to men’s health, and with his new found love for paddle boarding, Whitfield conceived of Stand-Up Paddle For Men’s Health, a project where a group of paddleboarders would paddle across the Salish Sea from First Beach in Vancouver’s English Bay to his home turf, Victoria harbour. 140 kms all up, over three days. The group ready to go! THE PADDLE The group of 11 athletes – including World Champion Lina Augaitis and former Olympian Duff Gibson – was made up of mostly professional athletes and a few paddleboard enthusiasts who took the challenge as a chance to do something interesting and fun, while helping raise awareness. 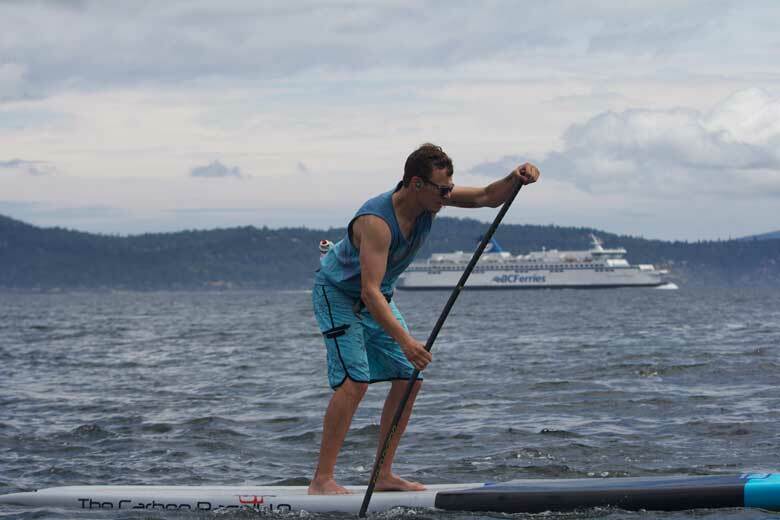 So what is it like to paddle board across the Salish Sea? Well day one of the paddle was definitely the most difficult. 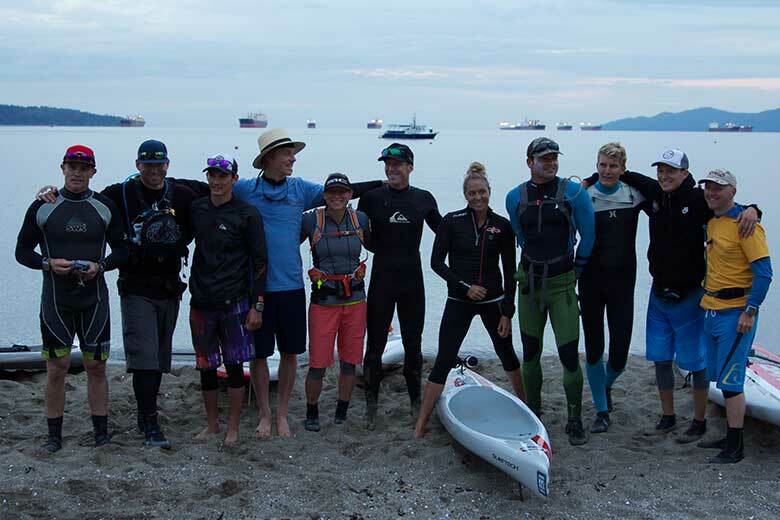 Up at 3:30 am, the paddlers met on First Beach in the dark. The mood was upbeat, but there was a palpable tension as the group collectively stared down the challenge that lay ahead. The water started calm and heading out past Wreck Beach all was going well, spirits were up and the group was having a great time. But then, not far into the straight, the wind kicked up and it went from something leisurely to being a grind. Whitecaps on the water and 4-foot swell pushing on their beam, the chit-chat dropped off as they turned their focus inward. Five hours in those conditions, and by noon, the team was feeling tired, but had crossed the Straight of Georgia. After a quick break for lunch on the North end of Galliano, the team had a bit of a challenge getting through Porlier’s Pass, a place where the rapids run fast enough to toss a decent size support boat ten feet. Once through though, they were in lee of the wind; battling a current, but at least not going into a headwind. Paddler Jack Bark braves the rapids. The next several hours were relatively calm, but it seemed to take an extra-long time to reach the first camp, in Montague Bay. At 6:00 pm, the group reached shore and mostly fell into a delirium of physical exhaustion. Fortunately, camp was set up. Tents made and a fire built. And there was food. Lots and lots of good, fresh made food by a local chef who focused heavy on protein for the paddlers. After a quick decompression and feed, most of the paddlers fell deep into a sleep, only to be up at first light to do it all over again. The subsequent days went roughly the same, although both were shorter. The second day saw only a few rough patches of wind and swell and the group arrived safely at Island View after an 8-hour paddle. Mike, Yannick and Markus enjoy a calm patch. On the final day, in order to beat the wind and the rain, the paddlers were up at 3:30am to be on the water by 4:30am. Fortunately, the strategy worked and they made short time of what could have been an arduous journey. Shortly after landing, the winds kicked back up to 25 knots – which could have spelled disaster for them. Close call. They paddled into shore with side by side, a few friends and family waiting with hot coffee and tea to help them warm up after paddling through a rainstorm. Exhausted, but proud, all 11 paddlers had reached their goal. 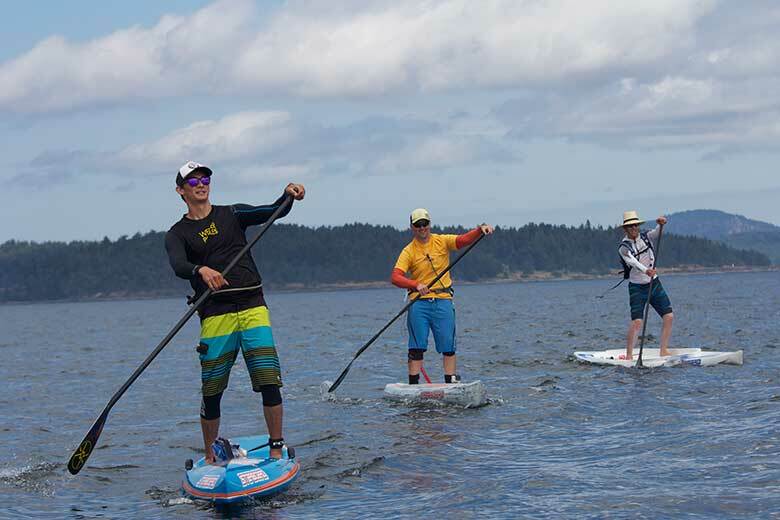 They took on a challenge and pushed through, and one paddle stroke at a time turned what seemed almost impossible at the beginning into a successful journey. WHAT NOW? “It’s not about the paddle,” said Wayne Hartrick as he address the paddlers the night before they all set off. “We’re not breaking any records here. It’s about men’s health and raising awareness.” Hartrick’s point is important. Men in general are far less likely to seek help for physical pain or illness and they suffer because of it. Men are 40% more likely to die of cancer, often times because they ignore the warning signs. 67% of men are overweight or obese and men are 79% more likely to die from heart disease than women. “Part of it is just that the culture in Canada of men’s health is one where guys don’t admit to feeling ill or never see a doctor,” says Whitfield. “We don’t think we can force guys into doing that, but we do hope we can get them to start making small changes, nothing drastic.” In the same way that the paddlers had to stare down an arduous 140km paddle, which at the outset seemed almost unachievable, men need to realize that they aren’t too far-gone to start making a difference in their health. Don’t Change Much, but change a little. After all, fries AND salad with your burger can actually be pretty nice. 3 days, 140km, all done.